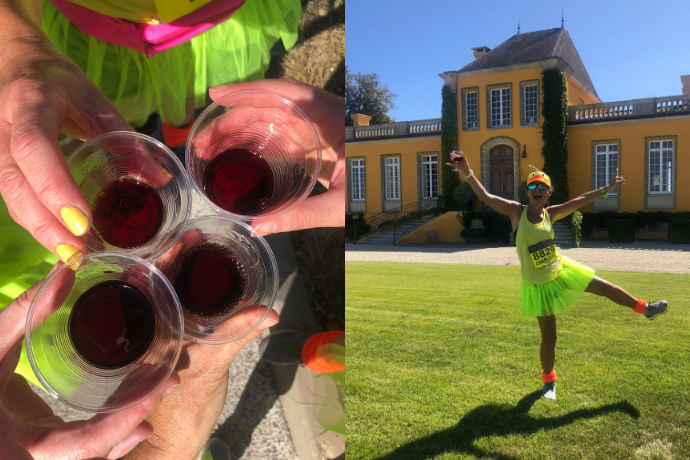 Review: We Ran The Marathon du Medoc and We're Still Standing! 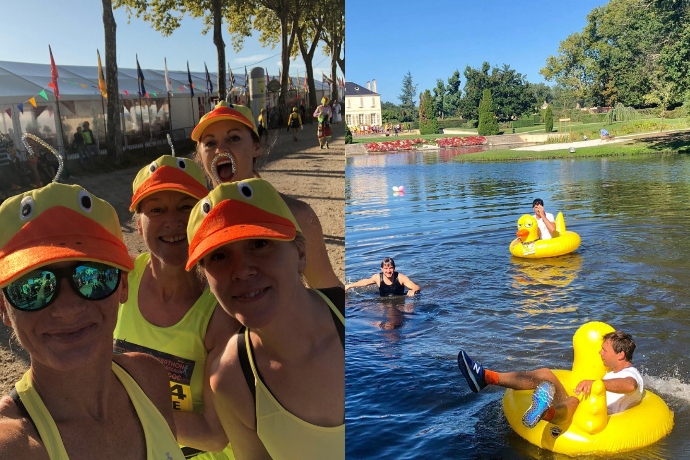 With more than 20 wine stops and oysters and steak on route, here’s how we got on at the Marathon du Medoc. Hic. 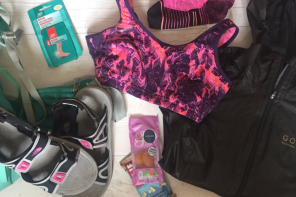 A couple of weeks ago, as I was taking off my wine-stained running kit to have a shower, an avalanche of sweaty confetti fell from my sports bra. It had been thrown there several hours earlier by a man dressed as the popular chocolatey spread Nutella. He was sitting on a large metal float wheeled by six women wearing pink wigs, hooped petticoats and armed with a bubble machine. And this, in a nutshell, is what you can expect from the surreally wonderful world of Marathon Des Chateaux du Médoc. 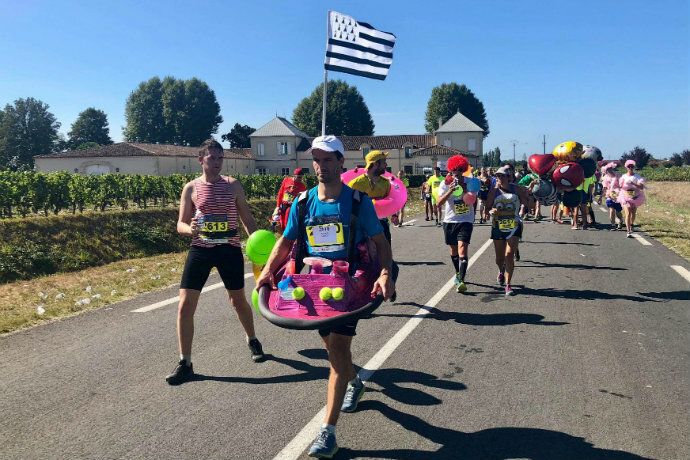 Not exactly your average running race, the Médoc is like pulling on your trainers and taking a jog through someone else’s trippy cheese dream. You’re never quite sure what’s going on but, strangely, you like it. So, what exactly is the Marathon du Medoc? 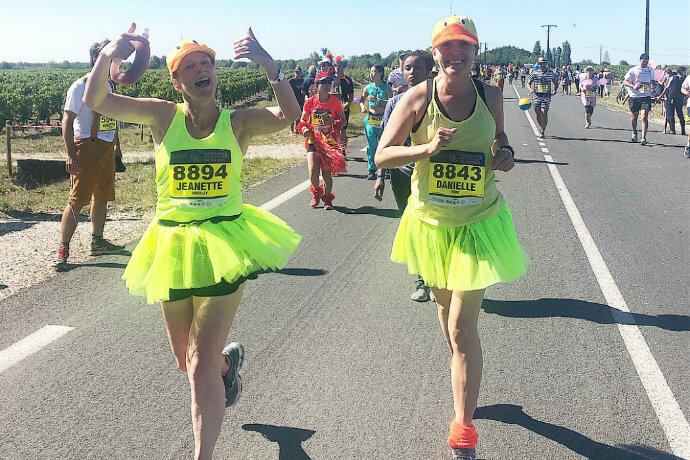 Now in its 34th year, the Médoc is a 26.2 mile romp through the wine-growing region of the same name, just north of Bordeaux in South West France. 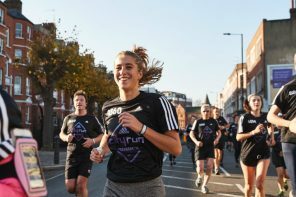 It’s become a bit of a bucket list event among runners selling out sharpish every year, with places for 2018 snapped up in just 20 hours. The reason for its popularity? Du vin. The marathon course, which winds through the vineyards and past the chateaux of some of the region’s finest wine producers, has 20-plus stops on route where you can sample local wines (yes, at each one!) and soak up the alcohol with delicacies including oysters, steak, ice cream and local canalé pastries. 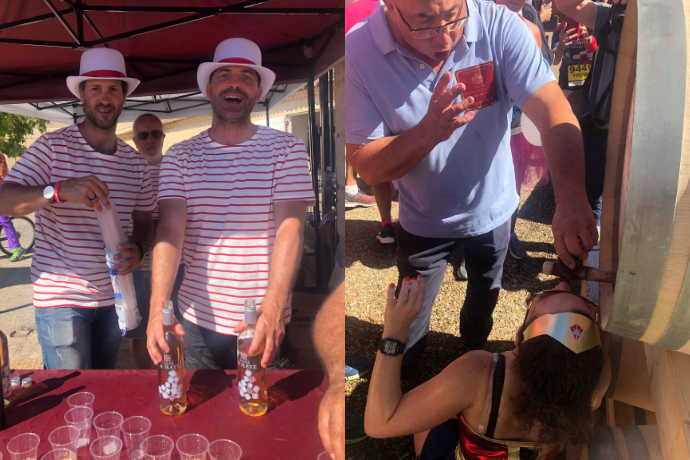 Fancy dress is mandatory – it’s in the race rules, there are live bands, you get a free bottle of plonk at the end, and the male and female winners receive their weight in Médoc wine. 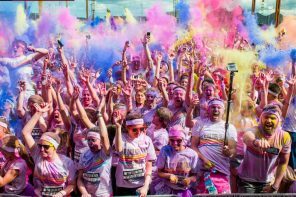 In short, this is a race where boozing, eating and partying is actively encouraged. Ideal. What’s the deal with signing up? 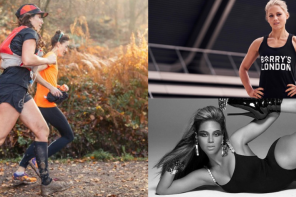 If you were to ask me to list my top five favourite things, running, fancy dress and wine would all be in there (the other two shall remain private but one of them’s crisps). So when friends starting throwing around the idea of taking on the Marathon du Médoc this year, my answer was ‘Mais oui’. Places go on sale in March and while we missed out on the standard €87 entries, there are loads of tour packages. 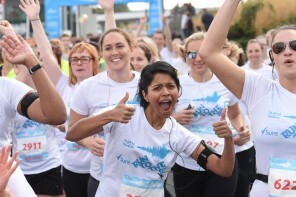 Starting at around €230, these include entry, accommodation at varying prices in Bordeaux, and transfers to collect your number and take you to and from the race start, which is in the small town of Pauillac, just over an hour’s journey from Bordeaux. This saves quite a bit of hassle booking additional transport and means, when you see a bare chested man dressed as Poseidon at the hotel breakfast buffet, you feel confident nipping over and having a chat. 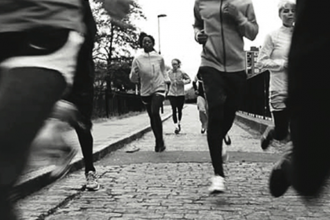 How many people run the Marathon du Médoc? 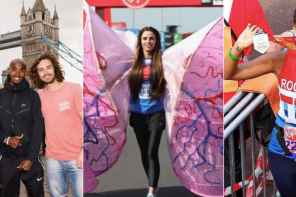 Flying into Bordeaux from London, the plane was full of runners – this year’s fancy dress theme was Amusement Park and the twirly strongmen moustaches of some of our fellow travellers were a dead giveaway. There’s an international field but Brits make up the second largest nationality group after French. Out of 8,500 competitors there were more than 1,000 of us buggers. This is because Brits are keen sportspeople and appreciators of the bucolic French countryside, obvs. The woman I sat next to on the plane was actually returning to Médoc for the fifth time. When I asked her what it was like she said, ‘Oh it’s amazing. But it’s still a marathon.’ She was right. Something I’d conveniently managed to forget in all the pre-race excitement, is that while it’s a lot of fun, the Marathon du Médoc is still a bloody long way. Lining up at the start on Saturday 8 September, with the three other members of my group – Angela who worryingly had boarded the plane the day before with a knee injury and a crutch, Danni who had never run further than 13 miles and Jeanette who, like me, hadn’t exactly gone overboard on the training front – I did start to wonder, will we make it in time? 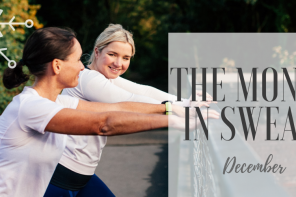 Because, while the Médoc is likely to be your slowest ever marathon (I mean why would you go fast?!) you can’t walk all the way. There’s a cut off point of six and a half hours, which is pretty tasty when you think of all the stops you’re making. And they definitely enforce it, with a jolly sweep wagon covered in multi-coloured broom sticks never far from your fleeing heels. 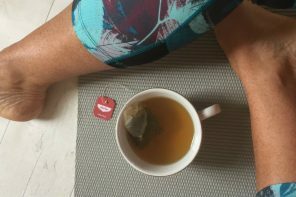 Err, what’s that in your water bottle Jeanette? 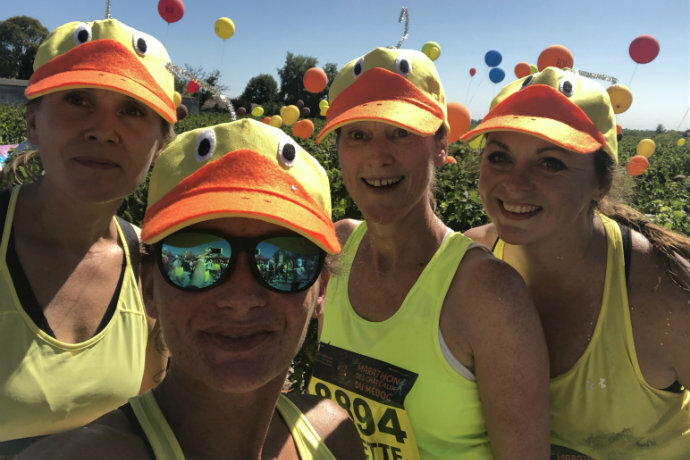 Forget nervous wees and checking your watch has got GPS, at the start of Médoc you’re dodging glitter canons and checking out everyone’s costumes – we thought we were being original going as hook a duck, so did around 1,000 other people. 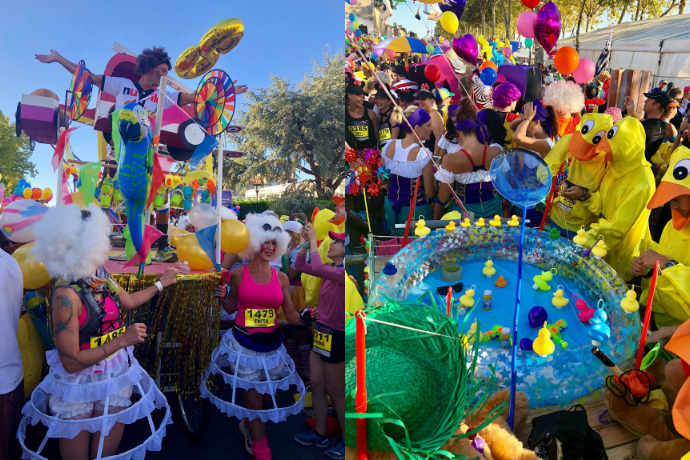 There are floats known as ‘carts’, decorated like mini carnival floats that runners push round, throwing out sweets and coloured smoke – one even had a barbecue on top cooking sausages, my sleep deprived brain couldn’t tell if this was real or not. Then the klaxon started and we were off, a procession of ducks, strongmen, dodgems and vikings (don’t know what vikings have to do with amusement parks but I liked their ship) running through countryside villages and vineyards, coming to a standstill when a cart with a huge inflatable duck on it got stuck down a narrow alley. The initial ‘Degustation’ stop comes 3km into the course at approximately 09.45 in the morning. The first couple of stations get busy, though, so if you can hold out till around 10am for your inaugural drink of the day you’re laughing. 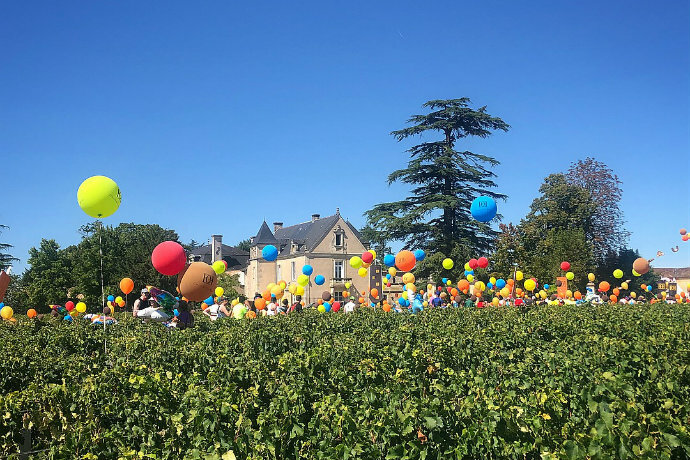 There are two types of wine stops, those at the side of the road manned by children/old people/chickens/anyone in the community who isn’t running, and the stops in the chateaux themselves. At the roadside we grabbed a quick vino but at the chateaux, as your very uncool uncle would say, it was party time. Each vineyard has it’s own brass band or live music, there were decorations, dancing, runners dive bombing into lakes, and sugary flat coke and crisps. Saviour. My main worry before we started was that I’d end up getting smashed halfway round and wake up in a French barn two days later. Needn’t have bothered. Wine was taster size and while you could go back and have as many as you wanted, within reason, the heat of the day – it was 29 degrees first thing in the morning – meant you weren’t tempted to drink too much. It was mainly red wine and that dehydrated tongue thing doesn’t work when it’s warm. The couple of miles running between chateaux helped to sweat some of it out too. Mmm, wine sweat. Did you beat the sweeper? 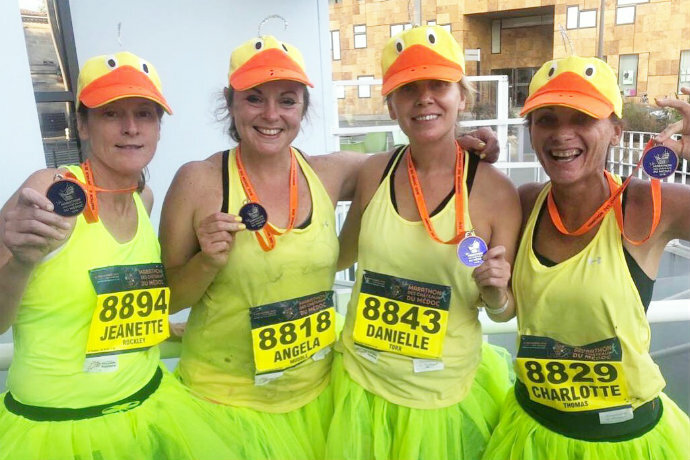 We lost Angela half way round when her knee started to hurt and she said she was going to drop out but after a few more wines she was back like a duck-shaped boomerang (she’s Aussie) so we all managed to finish – not together but near enough. 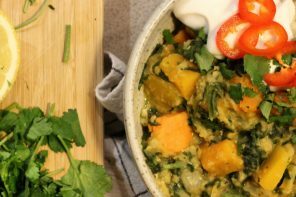 Being vegan I said shucks to the steak and oyster stalls – they’re all in the last five km as you head back into town, and after the cooler country roads this long straight patch of tarmac was bloody boiling. So I carried on, crossing the line 15 minutes ahead of the sweeper – around 14 minutes and 59 seconds faster than I was aiming for. 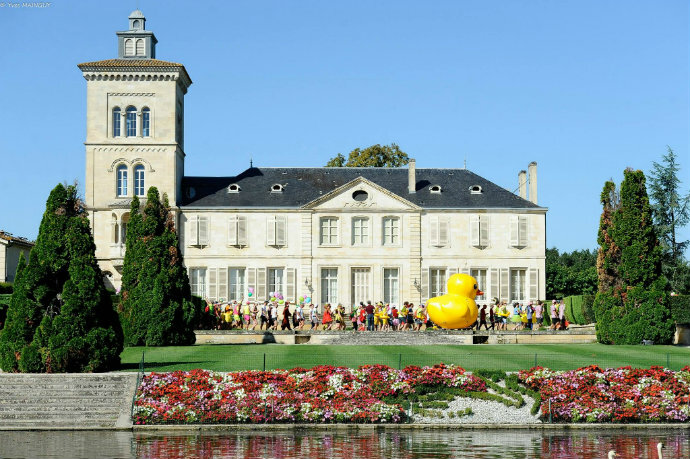 Would you run the Marathon du Médoc again? On finishing we were give a medal (standard), single rose (romantic), cooler bag (handy) and a bottle of wine. I had the hiccups. On the bus home someone started opening wine bottles with their shoe. 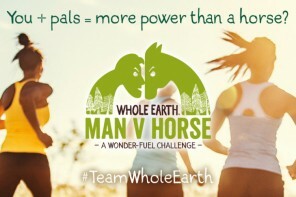 This is a race that never managed to get anywhere near normal. I liked it a lot but I think my brain needs a breather before I do it again. It can also end up costing quite a bit so next year we’ll go to Bacchus, the UK version at Denbies vineyard in Surrey. 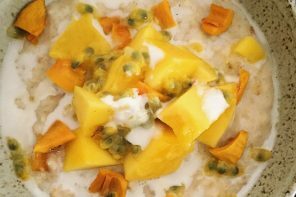 It might not be as decadent but there is a much more palatable half marathon option. Médoc can wait till 2020 for our return. 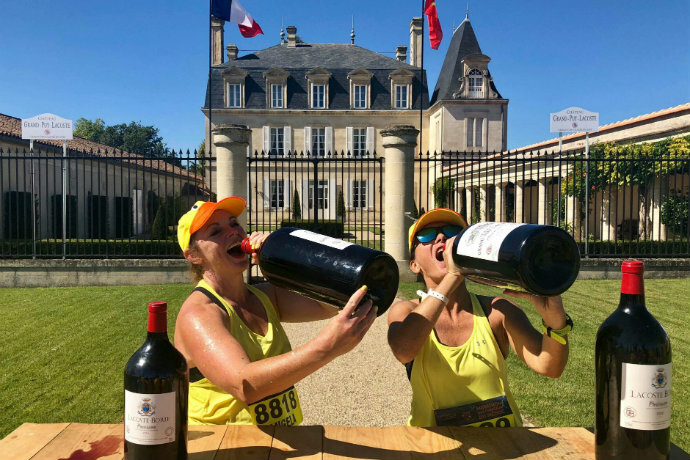 Interested in taking place in the Marathon des Chateaux du Médoc in 2019? 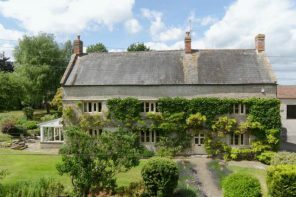 The website is a bit tricky to navigate but see if you can find your way round it here.